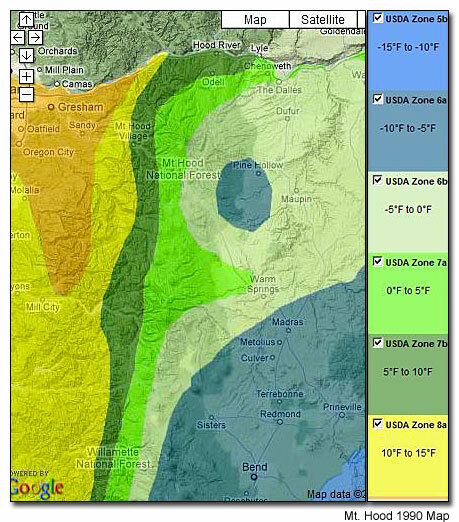 The USDA Plant Hardiness Zone map for 2012 is now available, causing a lot of discussion and grumbling among gardeners. The map was generated using average annual minimum temperatures, divided into 10 F degree zones. The zones were calculated using 30 years of temperature data from 1976 through 2005. To generate these zones, the USDA used data from 7,983 weather stations across the USA, along with elevation data, proximity to water bodies, and topography. Various sources of data were combined and aggregated into a half-mile square digital grid using PRISM climate modeling software. The zone designations were then reviewed and refined by a team of climatologists, and agricultural and horticultural experts. This map is much more accurate than the 1990 map, but many gardeners are still skeptical. As a geography and map geek, I think the map is a fine tool, showing much more detailed climate data. 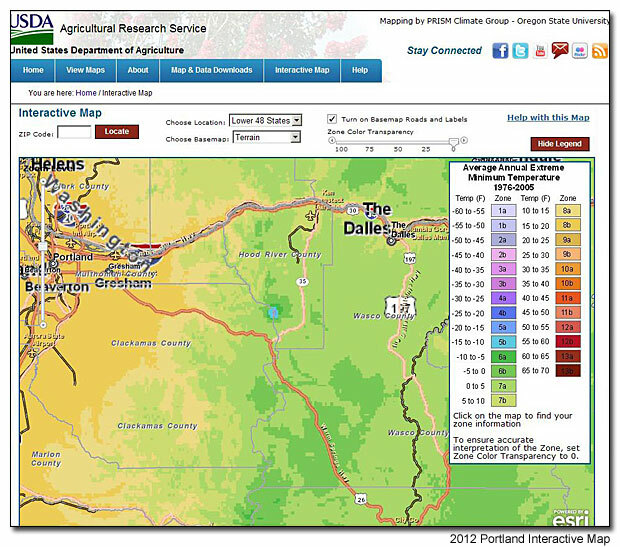 The graphic to the right, taken from the interactive map at Plantmaps.com, shows the 1990 USDA plant hardiness map. The zones are very gradual and do not show important details, such as a zone change one would expect with the increase in elevation. As you can see here, the map shows all of the Mt. Hood area, including the peak, as zone 6A. 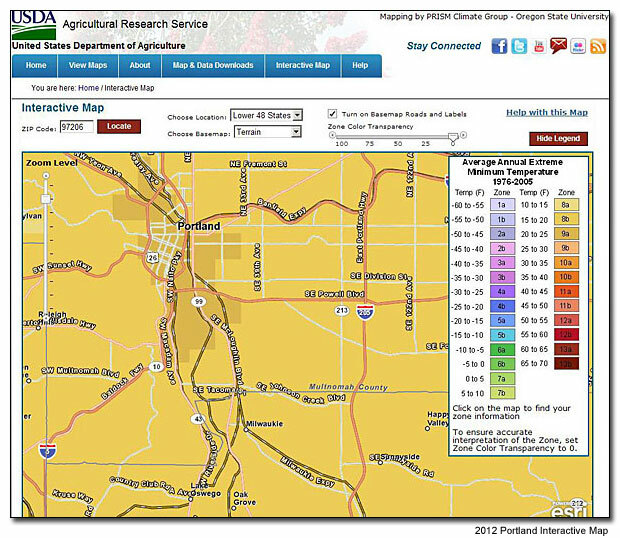 In contrast, the 2012 plant hardiness map shows changes in the zone designations due to elevation gain. The tip of Mt. Hood is zone 3A. The 2012 map is also controversial because it depicts an increase in mean temperatures, throughout the USA. The graphic below shows downtown and inner Southeast Portland, using the 2012 map. This area is now labeled zone 9A. The 1990 map has the whole area as zone 8B. Is the area getting warmer? Is it because the 2012 map uses 30 years of data instead of the 13 years for the 1990 map? Whether the earth is warming or not, this confirms what many gardeners know about gardening near water bodies and areas with a lot of blacktop and concrete. It is at least 3-4 degrees warmer than the surrounding area because of these conditions. It always amazes me to see marginally hardy plants thriving in these areas, where the same plant would be either burned or floppy with cold damage in my garden, just a few miles to the East. Many factors contribute to the hardiness of a plant, such as available sunshine, soil conditions, access to insufficient or too much water, and wind. Mean annual minimum temperatures are just one factor. 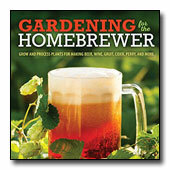 The 2012 USDA Plant Hardiness Map is a useful tool for any gardener. However, nothing replaces experience and time spent in the garden for creating and maintaining your own successful plot.